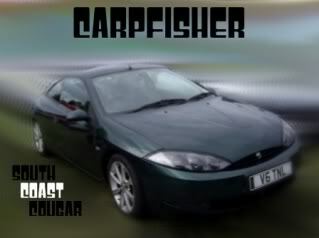 Yup after being a member of ukcougar.com/ukcougarforums.org since 2004 I've decided to come on here for a look (the 3.0L cougar for sale gave me some inspiration) those who have been members of both clubs from the begining will know who I am, I'm not easily forgotten lol. Currently cougarless but that could possibly change later in the year after my wedding in May, however before that I will be taking possession of a brand new 2014 plate Ford Kuga Zetec 140hp AwD SUV from motability due to being diagnosed with cancer last year, yes a bummer, the new car is finished in the brand new deep impact blue metalic with privacy glass, aluminum roof bars and rear parking sensors, it will be ideal for when we go camping and drive around the country (it being a Tdci it averages out at 46mpg on the devils fuel) as I say I have fancied a new cougar since selling my frosty C2 in February last year due to financial problems, currently driving a mk4 fiesta nick named "uncle fester" it's a bit RAT look but does the job to say it's 17 years old now. At the hospital today having chemotherapy session #4 so got a lot of free time on my hands. Glad you finally came over here just to say Hi if nothing else Matt ... The new Kuga sounds great so make sure you post a few piccys when you get it . Hi Matt, I know where your coming from about the Hospital treatments, good luck with that. Matt, Again sorry to hear about the inoperable cancer & Like your attitude about it. I was quite lucky my cancer was operable, which was march last year. my first follow up was supposed to have been last week but was cancelled the day before, now I am waiting anxiously for them to rebook it. Not sure what to say Matt except I'm sorry you've had such awlfull news. It sounds as though you're confronting it with a positive and extremely brave attitude mate. I'm speechless Matt your bravery and attitude is outstanding fella and it goes without saying you have our support at SCC.